European styling meets American convenience in the Mosaic Stroller! This sleek, compact stroller has a combination 3-point or 5-point harness, large parent cupholder, easy access basket, and a removable armbar. This stroller also has a compact fold, leaving plenty of room in your trunk for the rest of your gear! Best of all, this stroller accepts Graco SnugRide and Infant SafeSeat car seats! Recommended Use: For infants and children up to 4 years old and less than 40 lbs. I have been using this stroller for more than a year; got 1-yr and 4-yr old that have test driven this model to its limits; First thing to say, it's odd to find a compact stroller that is able to fit older toddlers if they wanna take a nap, and this is one of them! this is one of its great advantages. On the other side, its is somewhat heavy for an umbrella model, but that hasn't been a problem for me anytime. Still fits easily even in compact car trunks; and the wheels do a nice work when you are on irregular floors (or even sand). Now for the dark side: maybe it's just me, but everyone who has kids knows that you learn to do almost anything with one hand; from preparing breakfast to surfing the web, you know what i mean. Well, it's ALMOST IMPOSSIBLE to open this stroller without using BOTH HANDS. It should open with a quick kick but it has NEVER opened on the first try, it's just difficult. Ok then, another minor flaw: the canopy is REALLY small; don't forget sunscreen or a dangling piece of cloth to protect your loved ones from the sun. Speaking of the canopy, the folding design of the stroller makes the canopy edge make full contact with the front wheels; so it will get really, really dirty after... yeah, you guessed it... the very first use. And on top of that, the canopy's edge is always a light color, it only makes it seem worse. Maybe i have been too harsh on this one, but be aware that i'm giving it four stars anyway. It is sturdier than it looks, can take a lot of damage and remain unscathed, but has some cons that you should consider. Overall a heavy-duty, compact-sized, older-toddler-ready stroller. You be the judge. This stroller was one of my best purchases. I wanted a lightweight stroller that I could easily manage through an airport. I recently used this on a trip to florida and couldn't be happier with the stroller. The stroller is easy to push and steer, it reclines to any position, basket is decent size. I have the Land's End Little tripper diaper bag, which fit perfectly on the back. My baby easily slept and played in the stroller. The front bar is nice because it has some padding my infant frequently hurts himself in my big graco with kicking the hard food tray, so this is nice because he doesn't hurt himself. I easily hooked toys on to the bar and he was entertained for hours. The only 2 negatives, small shade and the way it locks when you close it. The shade is too small, but all lighweight strollers have a small shade. 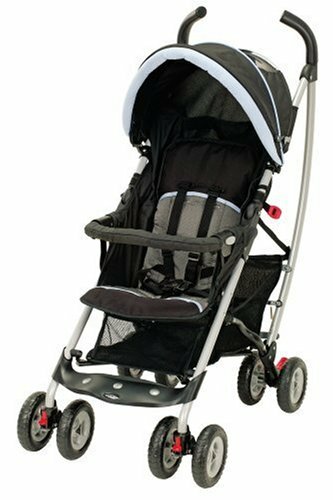 I had a Kiddopotamus sun shade on my larger jogging stroller, I just used that on this stroller and it gave my infant all the shade I needed. the mechanism that locks the stroller doesn't hold the stroller together securely enough. We bought some velcro and added an extra strap the we used when gate checking the stroller so the stroller didn't come apart when they threw it under the plan. We have a travel system, also from Graco, with the Stroller, car seat, and the works, and was looking for something the didn't take the entire trunk of my wife's car like the stroller from the travel system. This stroller is fairly lightweigh, folds more compact, and has some features that a umbrella stroller does not. I'm over 6'1 and can confortablly push this stroller without leaning over, which is a big plus, and a concern of mine when reviewing other "light weight" strollers. I love this stroller. I have it in the black and red. I used it with my son for 2 years and now I am using it for my daughter. It fits my Graco snug ride car seat just right. It is easy to fold even while holding the child and is not heavy. Does not take up as much room as other full sized strollers. I also like the removable cup holder. The basket is also plenty big. I bought this stroller after trying to decide between the graco IPO and this model. As a mom of three this is to be my "forever" stroller--the one that stays in the trunk and will last our family until it's time for grandkids. It came quickly and is really good looking. Easy to assemble. It seems very durable and tough, but the tradeoff with that is that it is heavier than I thought it would be. The IPO was lighter weight (by about two pounds) but also had a higher weight limit, so consider that if it's important to you. It folds and unfolds easily and quickly, but it takes up more room in my trunk than I thought it would and it's curved funny when folded so you have to put it in just the right way or it rolls around/tips over. Loaded with features. I'm not thrilled with the adjustment of the seat--my 2 yo is always straining to sit up and the way it tightens, it just won't sit her up any higher. I wish I could tighten it up just a bit. Decent basket size and the handles are a great height for me (I'm 5'10"). Feels solid and rugged, but is narrow enough to fit through most aisles. i can't say enough positive things about this stroller. it's great!! non-bulky & my daughter is very comfortable. breaking it down to store in our small apartment is a breeze as well! my favorite things about the stroller is the storage on the bottom & the height itself, i'm only 5'4'', but i don't have to hunch over to push this & i love that!! it was extremely easy to put together, it took a grand total of 10 minutes. my only complaint is the cup holder wouldn't attach but, i bought a hanging storage/cup holder to take care of that problem. Great stroller for taller parents! I bought this stroller as a travel system when my daughter was born. It works well because it's not as bulky as other travel systems. I have taken this stroller on public buses with no problems. Also, I'm 5'9" and I have trouble finding a stroller that I don't have to bend over to push. This one is very comfortable for me and for daddy, who is 6'3". When my daughter was one, the stroller was stolen and I bought the same one again. The handle to close the stroller is much better on this newer version and the latch to hold it closed is a little more sturdy as well. Now that my daughter is 2 1/2, we don't use it quite as much, but it's still invaluable for corralling her at the mall. I'm keeping it to use for number 2.